If your building design calls for the look and feel of masonry columns with the benefit of economy, ease of installation, and reduced weight, FiberCrete™ GFRC Columns Covers are your ideal column cover product. 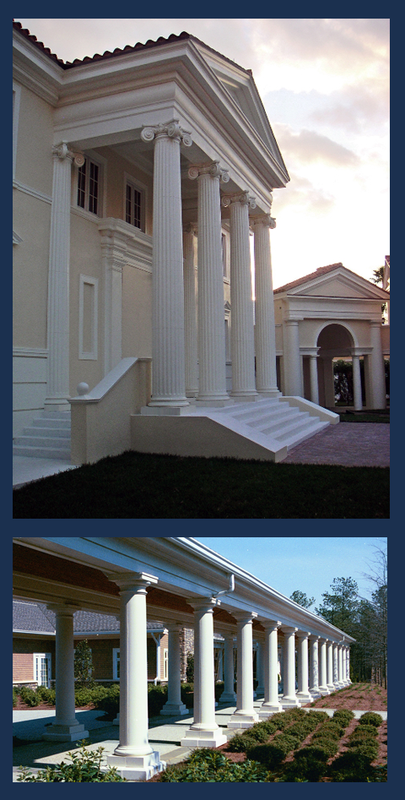 GFRC columns are more durable and easier to install than poured concrete columns, and have much improved durability and greatly reduced weight. Your FiberCrete™ GFRC column covers can be cast ready for application of a primer and paint finish to match your other painted surfaces, prefinished to simulate stone, or color cast in one of our many custom colored finishes. They also can be cast in a range of different surface textures. For complete coordination of your design elements, FiberCrete™ column covers can also be color coordinated with our broad selection of MeltonStone™ cast stone balustrades and architectural elements. These beautiful and economical GFRC column covers are available in diameters from 12” to 48” in diameter, and in heights from 6’ to 40’. GFRC column covers are designed to have visible joints and quirks similar to the designs of Greek and Roman columns of antiquity, but can be also provided in contemporary straight shaft designs with or without banding reveals as your design requires. Whether your design calls for a simple Tuscan column or a contemporary cylinder design with reveals, Melton Classics has the ideal column cover design to enhance the beauty of your project. Please call one of our experienced GFRC column cover specialists at 800-963-3060 today for a free consultation and quotation on economically priced FiberCrete™ GFRC Column Covers by Melton Classics.